Former Edgemoor neighbor Ken Feinberg, an attorney who specializes in mediation and alternative dispute-resolution, gave a riveting presentation over 55 BMAV members and guests on January 29. His talk, “Unconventional responses to unique catastrophes – tailoring the law to meet the challenges” -- dealt with his experiences as administrator of the September 11 victim compensation fund and other funds set up to respond to tragedies, including Hurricane Katrina, the BP oil spill, the Virginia Tech shootings and the 2013 Boston marathon bombings. Understandably, listening to so many people pour out their hearts can be draining. Feinberg found that classical music eased his soul and went to the Kennedy Center and other music venues as often as he could. Our next speaker will be local Bethesda historian Bill Offutt, on March 19. For details, see the item in the “Upcoming events” section, below. BMAV members Jim and Naomi have lived in Bethesda since 1972 -- in their current house since 1997. They love their close-in neighborhood, which enables them to walk to shops, the library, the movies and the Metro station. Noting that Bethesda has changed a lot over the years, Naomi said she can remember when the library was in a red brick house on Edgemoor Lane. Naomi and Jim plan to age right along with BMAV. For now, they are vetted volunteers: Naomi as a driver for BMAV members needing a ride to medical appointments or the grocery store, Jim as a handyman for simple repairs and giving advice if more complicated repairs are needed. In time, they think they will be probable users of BMAV services. Jim’s career as a Foreign Service officer meant that they spent a considerable time living abroad. He served in the U.S. embassy in Amman, Jordan, at the consulate general in Izmir, Turkey, and had three different postings at the embassy in Moscow, ultimately as U.S. ambassador to the Russian Federation, from 1997 to 2001. He currently is senior associate and diplomat in residence at the Carnegie Endowment for International Peace. He also serves on boards of organizations that support Russian exchange programs for students, leaders and professionals. Naomi, who is on the board and is a pioneer member of BMAV, had a parallel career. She has a doctorate in history, with a special focus on cultural history, and like Jim, has an abiding interest in Russia. In fact, she was a graduate student at Moscow State University. She joined him for his two tours in Turkey and Moscow, where she found work in the cultural history field, and for intervals in Jordan and again in Russia. She stayed in Bethesda while their two sons were young, and during that period, re-engaged with her career as executive director of non-profit organizations. In 2007, she wrote Through Dark Days and White Nights, her reflections and impressions of an American woman living in Moscow for several years over four decades. She serves on several nonprofit boards and is consultant to nonprofit cultural and higher educational organizations. BMAV looks forward to a time when Naomi and Jim will share their memories and perspectives with the community in an informal chat. We’ll let you know when a date is set, and we’ll also post it on the BMAV Events calendar. Yoga. There’s a new yoga shared-interest group that meets Monday mornings from 10:30 to11:30. If you’d like to join or want more information, contact elysejacob@gmail.com. There is a fee for this class. Knitting. The Village Knitwits knitting group has taken off. All levels are welcome. 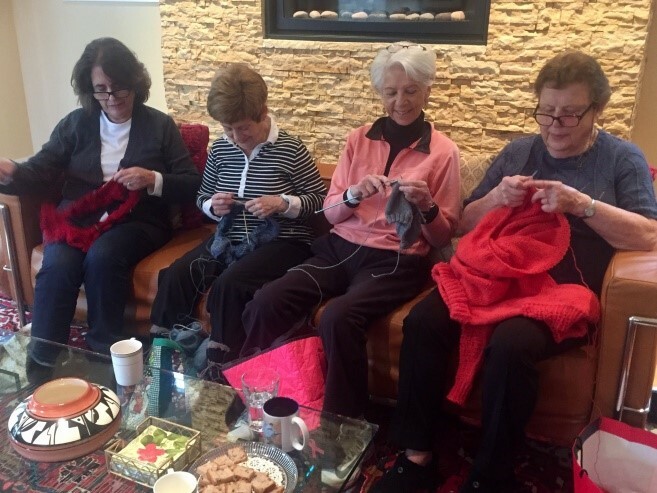 If you’re interested in joining the group for knitting and conversation, contact Hanne Caraher at hcaraher@verizon.net. Birding. David Moulton leads early morning (8 am) neighborhood bird walks about twice a month. If you’re interested, e-mail him at moulton.davidh@gmail.com for more information or to be added to the group’s list of walkers. Bridge. We’re still looking for more people who are interested in learning to play bridge or to be matched with others with similar experience. If interested, please contact Meredith at BMAVillage@gmail.com and complete the Bridge Survey found here: Surveys (must be logged into the website as a member to access the survey). Genealogy. A few BMAV members have indicated their interest in forming a group to learn more about their family origins or the whereabouts of long-lost cousins. If you are, too, or you have genealogy experience and are to help guide interested BMAV-ers, please let us know by emailing or calling us BMAVillage@gmail.com or 240-630-2628. Aging, dying and death. BMAV member Chris Palmer has proposed starting a group to explore aging, dying and death, to meet once a month for 90 minutes. The group could discuss a relevant book they have read, watch a video, have a guest speaker or simply talk about a particular topic that everyone is interested in. Some possible topics include re-interpreting retirement so that it’s more exciting and meaningful; being a wonderful grandparent; creating a living will and organizing your financial affairs; avoiding the indignities and humiliations of old age; and dying with dignity. To kick this off, Chris has proposed a first meeting on Sunday, March 5, 3 pm, at his home. If you’re interested, please send him an email at palmer@american.edu or call him at 202-716-6160. Fitness. BMAV would like to partner with the National Institute on Aging's program (see the Go4Life website for details). Participants would attend a two-hour orientation workshop on the pilot "Fit4Function" and be provided materials to continue the program on their own or with other members. We’ll participate only if there is sufficient interest, so please contact Meredith at BMAVillage@gmail.com as soon as possible to let us know if you think you’d like to participate. Would you like to start an interest group such as film, breakfast club, or walking group? If so, please contact BMAVillage@gmail.com. Sing-along with Dolly & Friends. 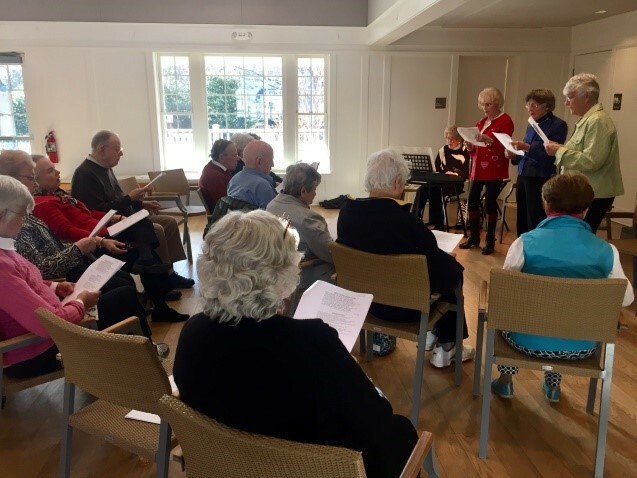 On February 15, an enthusiastic group of BMAV members and guests lifted their voices at our post-Valentine's Day sing-along. Accompanied by Dolly and Friends, the group warbled though dozens of old favorites from “A Bicycle Built for Two” to “Cabaret.” They were warmed by hot cider and congenial company and nourished by cookies and music, the food of love. While Dolly & Friends played on, the group raised their voices -- perhaps not always in perfect harmony, but certainly together in shared good spirits. See photo below. Morning at the movies. See a movie at The Avalon Theatre, 10:30 am, Thursday, March 16 and April 20 (third Thursday of each month). It’s only $5 for anyone over 60. The name of the movie is announced one week beforehand; call 202-966-3464. If you’d like to go early and join other BMAV members at the café inside the theater, do! If you need a ride or can give a ride, let us know and we’ll help arrange it when you RSVP to BMAVillage@gmail.com or 240-630-2628. Bethesda and Beyond, a talk featuring William “Bill” Offutt, author of “Bethesda Social History” and local historian, on Sunday, March 19, 3-5 pm. Have an idea for an event or want to host a small group for a morning coffee or evening happy hour? Please e-mail BMAV executive director Meredith Bowers at BMAVillage@gmail.com or 240-630-2628. BMAV needs a calendar-keeper for the BMAV website. The calendar keeper is a key village volunteer. This person regularly checks the websites of a few community organizations to look for classes, programs and events that might be of interest to BMAV members, and then posts them on the calendar page of our website. Guidelines and training are provided. In addition to helping keep our website interesting and current, this is a great way to keep abreast of what's going on at BMAV and in the wider community. If you’re comfortable using a computer and can devote a few hours each month to this task, please contact Meredith at BMAVillage@gmail.com or 240-630-2628. If you have one or more old electronics you want to get rid of, such as a cell phone, GPS device, iPad, camera, blue-tooth speaker or laptop, please don’t toss them in the trash. EPA statistics show that 60 percent of electronics end up in landfills, where their toxins, such as lead and mercury, can leach into the soil. That leaves three good options: sell, donate or recycle them. Sell. Generally speaking, the newer the electronic, the better chance you have of getting some money for it from one of the following: Amazon.com; Best Buy, BuyBackWorld; Gazelle; or Target, which partners with NextWorth. Donate. Several organizations accept electronics: American Cell Phone Drive; Dell Reconnect; eBay for Charity; and at least a dozen Washington-area charities (visit CharityChoices.com for a list of which charities accept what). Be sure you wipe phones and clear the hard drive on computers before you give them away. Recycle. For items you can’t sell or give away: Best Buy, for almost any kind of device with an on button; Call2Recycle, for rechargeable batteries and cellphones; and TIA E-cycling Central, whose website has a map you can click on to get a listing of recycling options near you, including those offered by local counties, cities and town. From “Sitting on old electronics? It’s time to cut the cord,” The Washington Post. 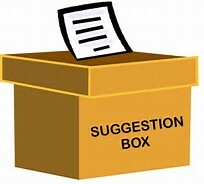 If you’d like us to include something in the newsletter that you don’t see, have an idea for an article, a suggestion or question about BMAV or our community, contact Lynn Barclay at barclaylg@earthlink.net or 301-320-4962.